Traditional backup solutions cannot provide the same benefits in a virtualised environment as they did in a physical environment The problems-as IT managers have discovered-range from lack of deduplication capabilities to limits on what can be restored from a backup image. It's clear that a new approach is needed to achieve a cost-effective backup solution for virtual machines (VMs)with a quick and easy restore. As the #1 solution for VM backup, Veeam combined with disk-based backup storage offers the capabilities IT managers want and need. VM recovery restores an entire machine from backup in a matter of minutes. Veeam has replication services, deduplication, and compression built in. Drobo provides superior data protection with BeyondRAID™ technology. Combining Drobo for disk backup in a solution that costs less to deploy and less to grow and manage over time makes perfect sense. Virtualisation is no longer just about reducing server hardware costs. By eliminating the "single-server, single-application" model, virtualisation gives IT the flexibility to efficiently manage resources and applications. Along with great benefits, virtualisation also brings new challenges and requires new storage and data protection approaches. Virtually no one is happy with their backup strategy and architecture. The same applies to backup of virtual machines. Server virtualisation initiatives are undertaken to reduce costs while also increasing service levels, yet traditional backup cannot do the same for VMs. There are several problems with using the same classic tools and approaches used to back up physical servers to back up virtual servers—as IT managers have discovered— from lack of deduplication capabilities to a dependence on multiple application clients to limits on what can be restored from a backup image. It's clear that a new approach is needed to achieve a cost-effective backup solution for virtual machines with a quick and easy restore. Consider what resource is scarcest in IT today. It is not capacity or performance since server virtualisation exists to use available capacity in the most effective way. Time is arguably the scarcest resource in most IT operations. Shorter backup windows are the requirement, and what IT managers want is flexibility to restore an entire VM, an individual guest or VM file, or specific application or user data in a matter of minutes—all from the same image-level backup. Easy trumps complex when it comes to backing up VMs. It starts with disk as backup storage. To get the full value of server virtualisation and mobility, a SAN is a must; shared primary storage networked among all virtual servers. Shared disk storage also provides benefits for backup compared to classic tape backup. Disk is much faster in terms of both throughput and locating and starting a restore job. Having the ability to restore from many different restore points on disk media is a tremendous advantage and really helps minimise recovery times. Today no one wants to manage tape, and with Veeam, you can use any iSCSI storage instead of having to invest in virtual tape to get the benefits of disk-based backup. As the #1 solution for virtual machine backup, Veeam combined with disk-based backup storage offers the capabilities that IT managers want and need. Instant VM recovery restores an entire machine from backup in a matter of minutes, a big help in lowering recovery times and enabling testing and verification. IT admins have the ability to start a virtual machine directly from its backup. Veeam also lets you recover individual objects from any virtualised application, enables file-level recovery, and allows users to restore their own files. 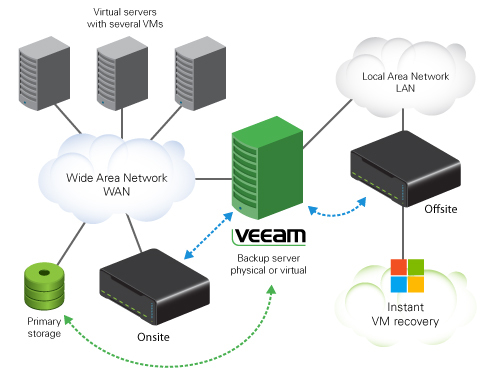 Veeam has replication services built-in, as well as built-in de-duplication and compression. Run a virtual machine (VM) directly from the backup file stored on Drobo, without having to first restore the backup to primary storage. Drobo's data-aware tiering technology recognises the "hot" data on the now live VM and automatically promotes it to the fastest drives in the array. This ensures optimal performance until primary storage can be brought back online. Unlike slower tape-based backup solutions, Drobo's disk-based solution deployed with Veeam lets you recover and restore individual files or objects for any virtualised application directly from your backups or replicas in seconds. Veeam patent-pending Universal Application-Item Recovery (U-AIR) technology uses native permissions, without putting agents on applications. Instantly Scale Backup Environment: Drobo BeyondRAID™ technology allows you to add or upsize drives on the fly. Additional storage is automatically added to a common pool and made available to Veeam within moments, unlike traditional RAID, which can take hours—or even day—to bring additional storage online. Advanced Thin Provisioning: Veeam can leverage thinly provisioned volumes, while most other solutions require close individual volume monitoring to prevent running out of physical storage. Drobo Smart Volume™ technology pulls from a common pool of storage, automatically allocating physical storage as required to ensure that individual volumes never run out of physical storage. Compelling Economics: You can enjoy all of the robust capabilities of VM backup without paying the same price as you pay for premium storage capacity. The simplicity and automation of Drobo storage drives down operating expense, and BeyondRAID provides "big storage in a small box." Affordable Onsite and Offsite Protection: Veeam Backup & Replication is a single solution, at one price. Combine Veeam software with cost-effective iSCSI SAN from Drobo, you get the flexibility to replicate VMs onsite for high availability, offsite for disaster recovery purposes, or both. Comprehensive data protection has never been so affordable! Built-In Deduplication: Leverage Veeam's built-in deduplication capabilities to shrink backups, increase the efficiency of Drobo storage, and further reduce overall costs. Veeam source-side deduplication lets you publish deduplicated backups as standard VMDK files. Reducing data size also enables more efficient offsite DR by reducing WAN traffic. If you haven't already done so, install Veeam Backup & Replication v5. Using the Direct SAN Access method in Veeam is preferred because it takes advantage of VMware Storage APIs, and backs up the VM datastores directly without going through the ESX/ESXi host. Run a backup with de-duplication and test the restore. You are now doing easy VM disk backup and the absolute fastest and easiest restore! To consolidate storage for disk backup while enabling virtual machine mobility, SAN storage is a must. And while everyone wants faster backup and recovery of virtual machines, many cannot make the considerable investment in classic backup tools or expanding their existing SAN storage. Even the lowest-cost iSCSI storage and entry licensing for VM backup are expensive by most measures. Drobo provides superior data protection with BeyondRAID™ technology in a package that is very affordable. Without the cost burden of unnecessary built-in features, you have the freedom to combine best-of breed-technologies tailored to your environment. Combining Drobo for disk backup makes for a solution that costs less to deploy and less to grow and manage over time. Incredible ease-of-use is a huge plus that saves on operating costs. Both Veeam and Drobo offer IT managers cost advantages with simple yet sophisticated features for any sized deployment. For smaller organisations, who are especially budget constrained and need to avoid complexity, Drobo is perfect primary storage for VMware Essentials or Essentials Plus. Veeam Essentials is a specially priced bundle of Veeam products exclusively for smaller VMware customers in environments that can leverage Drobo for backup storage as well as for primary storage.